The term Renaissance Man, historically has been used to refer to creative giants, such as Langston Hughes, Paul Robeson, Cab Calloway and others. There is a high standard in order to be referred to as one. A renaissance man is defined as, a person with many talents or areas of knowledge. The aforementioned men have left an indistinguishable impact on the world. Daunting, right? It makes you wonder whether someone of this generation can also be given that label? Well, Jameer Pond is working his way to earn that title in media when it comes to changing the landscape and pushing the narrative that Black creatives deserve to shine. He has worked his way up from many different roles to achieve the success he has now. If you’re unfamiliar with this soon to be media icon, then please allow us to introduce him. 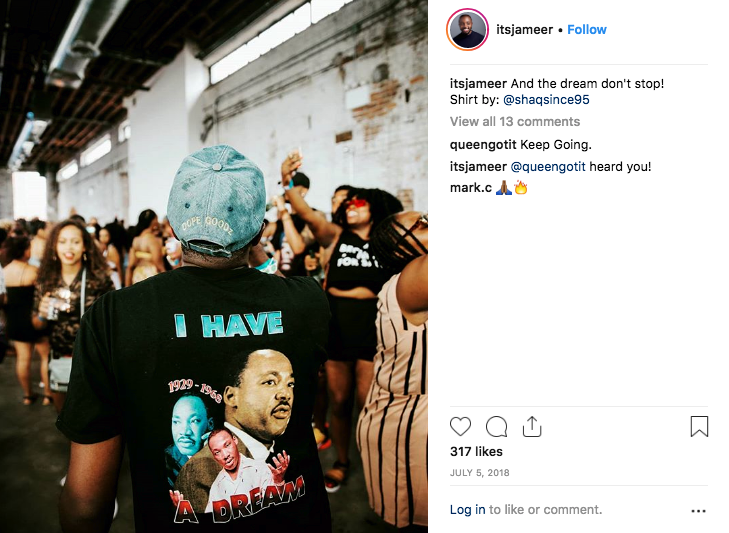 Jameer has been in the media world for over ten years, from producing content, hosting niche media events and running panels that center around Black excellence. We had the opportunity to speak with Jameer about his highs and lows during his journey in media and what it truly means to push forward the narrative for Black creatives. AHUS: A few years ago, these roles in media for Black creatives didn’t exist. What are your thoughts about being apart of the foundation? JP: I think it’s an uphill battle always, just because being Black and creative are synonymous, but people don’t recognize that. How people are getting started is by creating all of these trends, these spaces, and building these media companies without us getting the recognition. I think it’s always about pushing Black creatives forward. When I create content or speak, I always have to remember, I’m Black. I still need to remember to represent and that’s the foundation. Just continue to kick down the doors and create a dialogue. I think it’s super important that we continue to talk about us. The creativity is getting everyone else involved. It’s supposed to be like gumbo. I can’t make gumbo with just vegetables. Somebody has to contribute the seafood. Someone has to add the potatoes. We all have to come together and create this big pot. It’s just important to keep it amongst us and not sell ourselves short by just giving it to other companies so quickly. AHUS: You’ve worked in different roles such as a content creator & producer. Which one of these roles taught you the best lesson about yourself & career? JP: I would say working at Hot 97 as a content producer. It taught me to one, know my worth and two, never be a slave to the brand. I spent so many years (five and a half) trying to please the brand instead of trying to please myself, which isn’t fair to yourself. I learned from that, and every other experience that it’s me first, then the brand. You have to create things that you are passionate about that will feed you. You have to make sure to water your plant as well with the brand but think of you first. AHUS: You have a lot of creative projects that you put out into the world. You do it all from producing, podcasting, hosting and comedy. Which one would you say you enjoy doing the most? JP: Wow, I haven’t done comedy in a long time! I did it [recently in December] for the first time in nine years. I just wanted to try it again because it was so much a part of the foundation of who I am. Anything that I bring to any medium is always funny first. [Humor] is the one thing that brought me the most joy because it transcends. No matter what I am doing, I always try to bring that comedic light to it. Comedy is a gift, and it is my special gift. AHUS: You go hard for Martin Luther King, Jr., what causes you to be continually inspired by this man? JP: Now, with Martin Luther King, Jr., he taught me to still wish for equality. We won’t get that comfortable because of circumstances. However, his intentions and mental state were ideal, and it’s something that we want. At the root of it, protest and frustration are rooted because we want to be equal. We want to be equal, and we should be. MLK has always taught me to fight for that, and I keep that in mind. If I have to speak or create in a predominantly white space, I ALWAYS go in with my Blackness. You don’t have to be afraid. You also won’t treat me like I’m not equal. AHUS: You’re proactive at being a voice in the community for women and women’s rights. At AHUS, we have pushed the message to Believe Women. I want to know what comes mind when you hear that directive? JP: I think it’s precisely what it’s framed to be. Often we protect a lot of sick people; now I am saying that in general. However, specifically, when it comes to heinous crimes against women, we often protect men. Claiming, oh no he wouldn’t do that, without hearing a woman’s side. Sometimes it’s because they’re famous, sometimes we don’t believe this person is doing this. No one gives women the benefit of the doubt. Sometimes, we don’t even hear women out. I think being in the journalistic field, it's important to be objective. I applied it to cases where women are speaking about powerful men and being brushed off. You can’t do that to another human. This woman is saying, something happened to her, and to dismiss her is the worst thing you could do. We have to stop protecting monsters in this society. We have to do a better job of being objective and hearing women out. AHUS: What’s the impact you genuinely want to leave on digital media? JP: Total passion. Many people have that “thing” that makes them who they are. I think mines is that I am passionate and hardworking. That’s where my faith lies. I know I will be where I need to be. When there is a roadblock, I get up and figure it out. If it weren’t challenging it wouldn’t be for me. You have to embrace the fact you will slip and fall. Just never dim your light!